This is a reprise of the Polytone Amplifier Page from my old QRP HomeBuilder web site (2008). Above — The Mega-Brute has an eight inch speaker and is über-portable. This amp tucks into almost any corner. 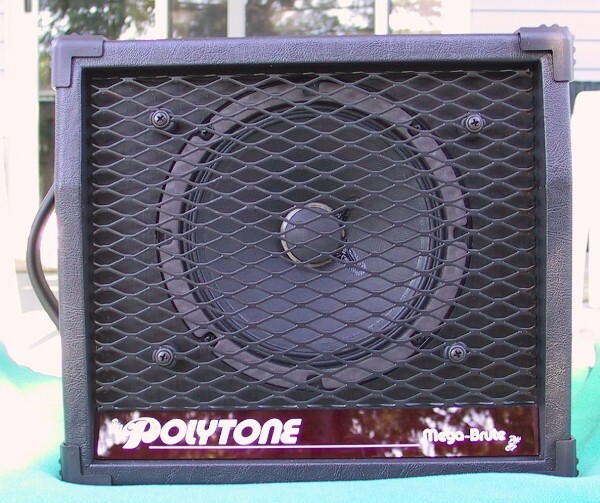 On the rare occasion when I play for a function, I may use a 12 inch extension speaker, depending on the situation. I've owned 4 different Polytone amplifiers and like their tone and compactness. I must disclaim this blog post by stating that what I have written is just 1 opinion. Discussing guitar amplifiers is akin to stepping into a quagmire. Guitarists often become quite emotional and speak passionately, or possibly even overly-critical when discussing gear. When you consider that most players don't even perform in front of an audience, or record for mass distribution, the "gear wars" diatribe can get really quite silly. 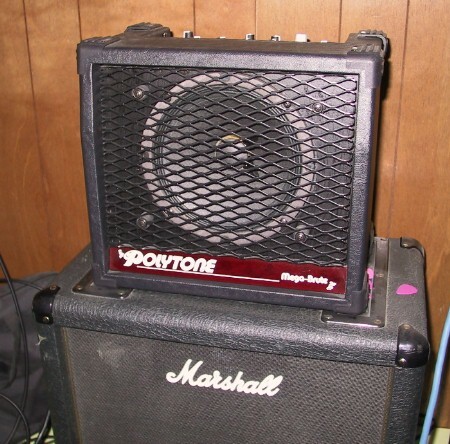 If your tone sounds good to you, then perhaps your amp is suitable (at least for this month). For jazz guitar, there are countless amplifier choices and the list of of good jazz guitar amplifiers has really grown in the last few years. The trend seems to be towards more hi-fi sound (less distortion-more headroom and more power), smaller/lighter designs at somewhat increased cost. Consider talking to Michael Biller at Sound Island Music if you wish to talk to someone with considerable knowledge and practical experience regarding modern jazz guitar amplification. Michael stocks many products -- and his passion about helping you obtain your perfect jazz or double bass guitar tone really shines through when you talk to him. ultra-high in fidelity ( compared to more contemporary designs ), has a dark voicing, a distinct midrange honk and starts to distort at high volume settings. This is exactly why I like Polytone amps in some situations. To each, their own. The Mega Brute combo amp has an 8 inch speaker. This is probably not the best amp to use if you play in a big band, but it works okay with a trio if you are happy with the sound it provides and the drummer uses brushes and/or soft hands with sticks. 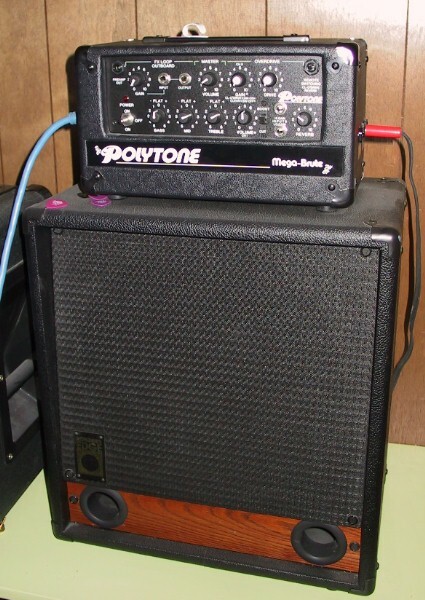 I have owned Mini-Brutes with 15 inch and 12 inch speakers as well as the Mega-Brute combo amp and head. The various Brute-series amps are worth a trial if you're in the market for a mid-price jazz guitar amp. 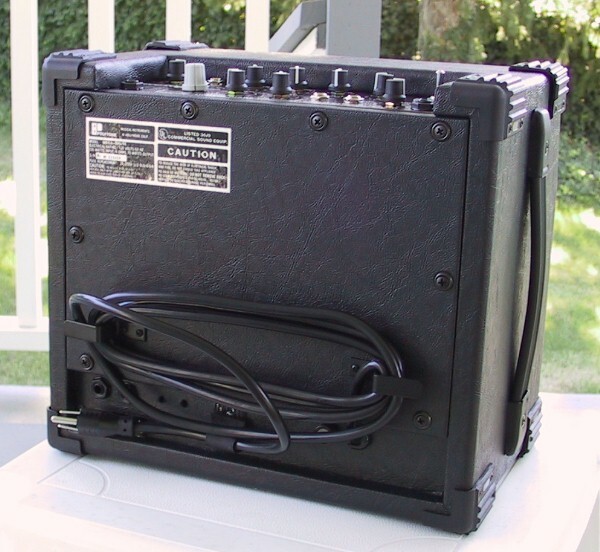 amps for that bass thump, although, in my opinion, ported designs are preferable. The porting seems to be via the via the low input instrument, pre-amp out and FX loop jacks! Above — Top view showing the various control pots and switches. The sonic circuit was a great addition to the Brute series. The previous Brute design had an overdrive circuit which failed to merit wide acclaim. I personally do not use the sonic circuit and rely upon the main amp circuit. I like the slight break up of the power amp when driven hard, although it is by no means a Marshall-style crunch tone. Baxandall equalizer plus decent spring reverb. combination for R & B plus jazz-fusion work. Mega-Brain. This product was discontinued. 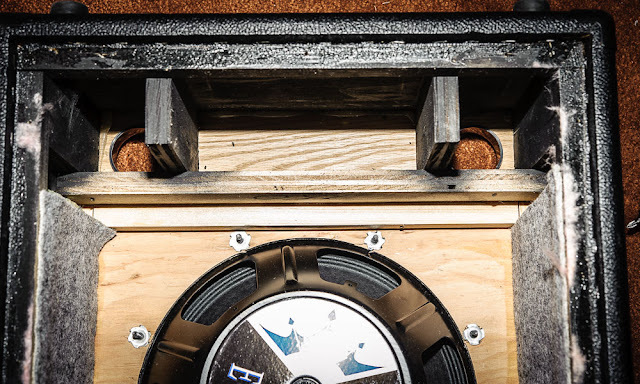 The speaker is a Raezer's Edge Stealth 12 speaker cabinet. I sold this head in 2004 and now regret it. 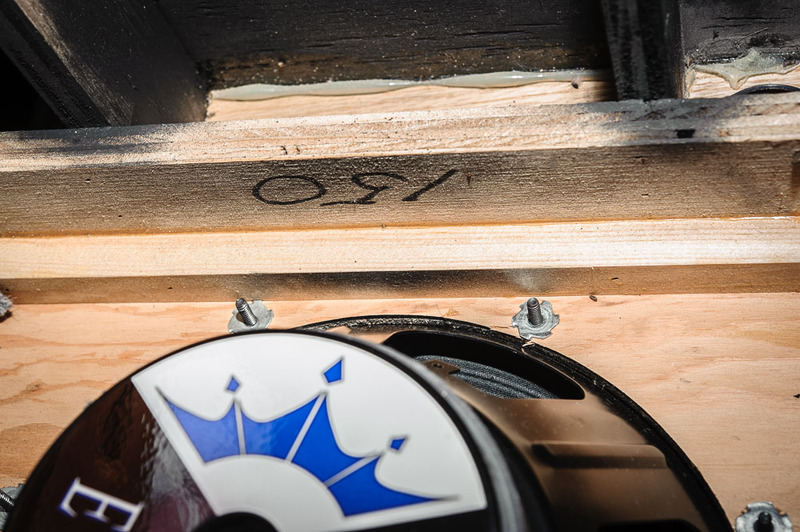 Above — Inside the Raezer's Edge Stealth 12 speaker cabinet. 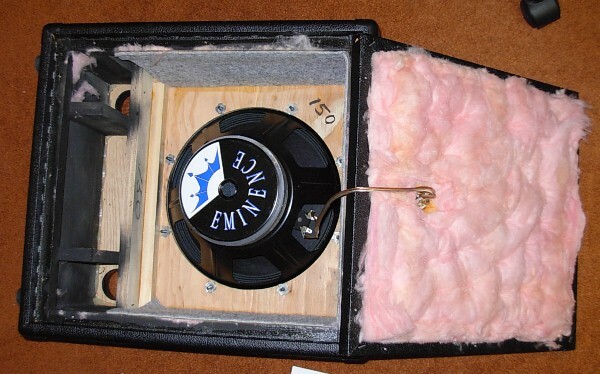 Underlay foam, carpet and fiberglass insulation absorb standing waves + reflections, lower the box Q and hopefully smooths the bass response. 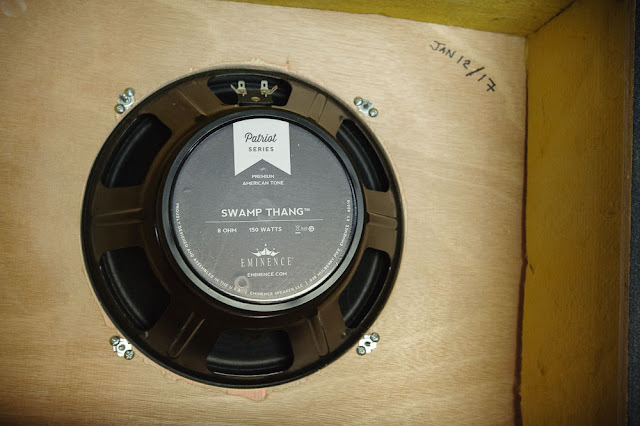 This speaker/box sounds warm with a flat response. Above — Various views inside the Raezer's Edge Stealth 12 speaker cabinet. Well engineered and built. Above — I like Eminence speakers; including the Eminence Patriot Swamp Thang mounted in another cabinet for my stereo amp rig. Above — My old Mini-Brute with a 15 inch speaker on its side ready to carry. Bass for days! Fantastic blog. Thanks for posting the images of the inside of the R.E. Stealth 12. 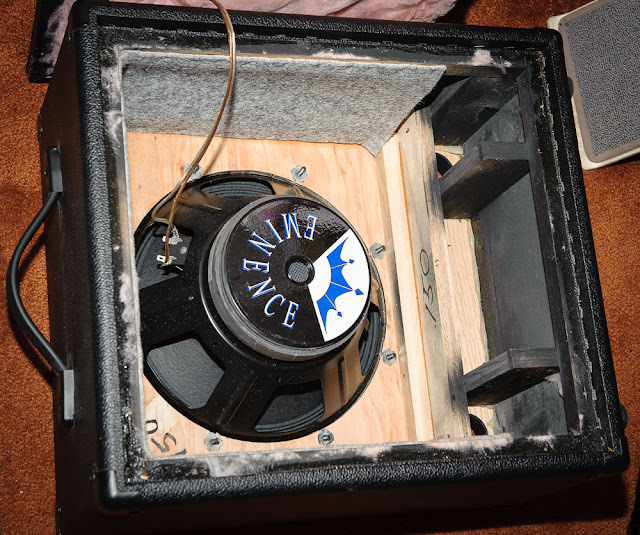 I'm hoping to build a clone using an Eminence Delta 12a and have only the outside dimensions. I was curious to know what is inside and how the tuned the cabinet. If you have the dimensions of the inside I'd be very interested. 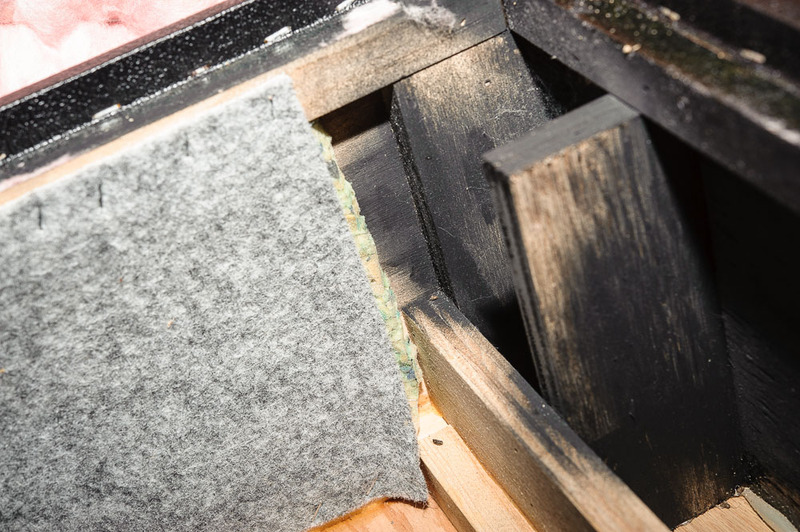 It looks as if there is an extra shell or something supporting that foam and insulation in the main part of the cabinet. I'm also curious about the diameter of those ports and the positioning of the dividers. Port holes = 2 inches diameter. The inner cabinet measures = 17 by 15.5 inches on the wooden strips mentioned below. A 3/4 inch strip lines the back of the box where the back is screwed on. On the speaker side, again a 3/4 inch strip goes around the edge. This, in effect creates a 3/4 inch deep "cavity" which hold the underlay, A grey carpet goes around the whole side on 3 edges. The shelf you refer to is framed from four 3 inch boards with a 2 inch board fastened perpendicular to them to make "the shelf". All glued and fastened -- and very solid. Thanks so much Vasily. I just noticed that your post was a reprise from several years ago, so I really appreciate that you went back in to get those measurements. I'm a little puzzled by your last paragraph. Would you mind elaborating on the shelf? I think I see 2 perpendicular boards supporting what appears to be a horizontal shelf running the width of the cabinet. Is this 2 inches up from the base of the cabinet? It also appears to be set back from the front of the cabinet by a few inches? If you'd rather email me directly, let me know and I'll figure out how to communicate off list. Again, I appreciate your patience. I just made a small donation to the Canadian Opera Company to honor your generosity and to help support that wonderful organization. Ah ha. Sorry for the last set of questions. I now understand your original description. The "2 in board" is the shelf. 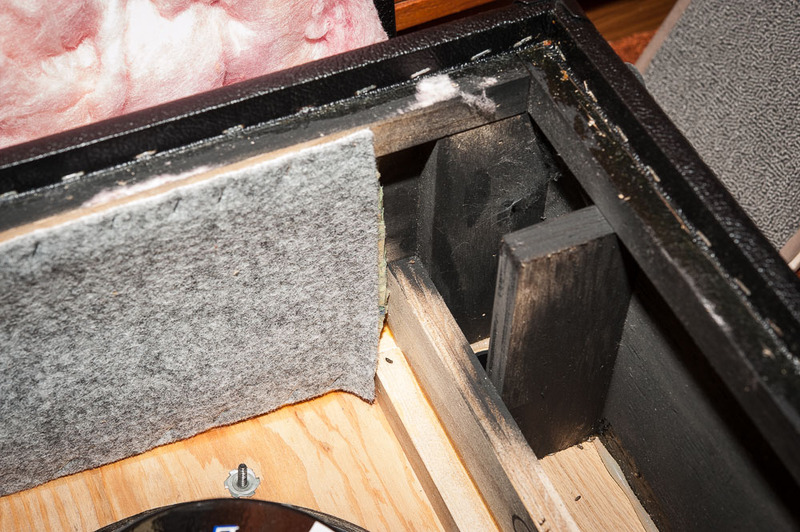 I'm guessing that the 2 inches is what is exposed beyond the 3/4 strip at the base of the speaker baffle. I'm going to guess that the shelf extends under the strip and probably supports the baffle, so the "shelf" board is maybe 3 inches? This was probably all worked out carefully by the late Rich Raezer to tune the cabinet for guitar frequencies.